It was 1945 when Spanish painter Salvador Dali and Walt Disney began working on Destino; ten months later the Project stopped. Some said Destino’s production halted due to budget reasons, others said the film deviated from Disney’s original idea. It took 58 years for the film to finally premier at the Annecy International Animation Festival (June, 2003). The plot of the animated short is very simple: the struggle of two lovers to be together. But it is told in a very unconventional –surreal– way. For six minutes a woman and a man-statue, who comes to life, dance and morph in a Dali style world. Dali’s paintings (think of Persistence of the Memory) always had rhythm and motion to them; Destino finally gives us that motion. But, that motion can be confusing for other people. As in art, people can interpret Destino in many different ways. Some of the elements remind me of Un Chien Andalou, a moon rising from behind the clouds as they rapidly move let to right, a close-up of a hand with ants coming out of the palm, and French men in black suits riding bikes. In a way, Destino is less bizarre than Un Chien Andalou and “easier” to interpret. The scenario is ever changing and moving keeping the two apart. Dali’s signature limp watches seem to represent the pain the lovers live each minute they are separated and how eternal each of those minutes can feel. Each of the 6min feel and look like Dali, not a frame of Disney, but only18sec of the short were created by him. A team 25 artists worked on the final piece for two years; they only had Dali’s story boards and paintings and his wife Gala’s journal. Monfrey’s team succeeded at recreating Dali’s style and designing the missing pieces. Since it’s premier in 2003 the short has been screened in museums but that year the short was screened before Disney’s feature Lady Killers*. In the screening I attended, the audience didn’t really know what to do with it, makes wonder would the reaction had been back in 1946. *At least in Latin America, I don’t know about the US. I saw this at MOMA and I thought it was pretty cool. Definitely in tune with the rest of Dali's work. Oooh -- I love this film as well. Appropriately enough, this was also screened at Telluride! I agree with Phil that this definitely fits in with Dali's other work -- and it's incredible to think that this is a "Disney picture" since it feels nothing like it. If you hadn't told me this was Dali, I would have thought it was Gerald Scarfe. It has a look that I associate with Pink Floyd. Especially with those two giants faces coming together. I thought it was a joke. 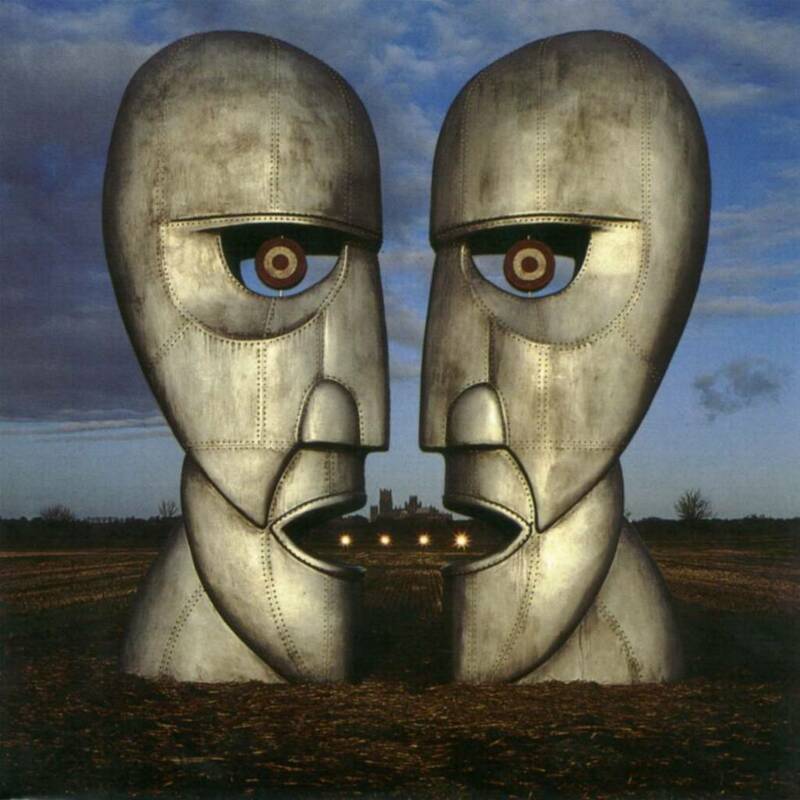 That's basically the cover art for The Division Bell. I have to disagree with Jeremy; while the cover art has a surreal style it doesn't resemble Dali's style or he’s world as used in Destino. If anything, it speaks of Dali's influence in the art world. And speaking of the art world, the contract between Dali and Disney stipulated that Dali's paintings and sketches for the short could not be sold until the short was released. ¿profit? You can see the whole short HERE . Note that this is from someone who snuck a camera in a theatre that's why I didn't post it before. jejejeje los rockers siempre viendo a Pink Floyd hasta en la sopa. It’s beautiful! Thanks for posting this :-) I even enjoyed watching the shaky-camera-sneaked into the theater-version posted on youtube. I can’t wait to see the whole thing in full quality. I definitely can see the references to Un Chien Andalou although you are right, it is easier to make “some” sense out of Destino rather than the earlier film. The story of two lovers who want to be together it is everywhere. But this short makes it colorful different yet amazing. How animation and a common story are combined together and developed it in a different way. I would never have thought of Dali-Disney colaboration. I guess it makes sense that Disney Co. would be concerned with the financial risk of releasing the film in the 40s.